We're great fans of curating content, and so we've put together this playlist of soulful christmas songs from YouTube. It's an alternative to the rubbish played in every shop at the moment. Because it's a selection of what is already on YouTube we can't edit the graphics - so it's one to listen to rather than watch. It's about an hour long and we find it's best enjoyed with a large glass of NZ Pinot Noir. Over the years I have probably nicked more charts from Morgan Stanleys Mary Meeker than anyone else. Why? She is always right on the money and she supports her views with really good data. In her presentation at Web 2.0 yesterday she nails it again - it's all about mobile. The staggering Apple results, the momentum building around Android and the way people are embracing mobile as the remote control for their lives, tells us that mobile is the only game in town. Enough people have smartphones ( and everyone else wants one) , the distribution through the burgeoning app stores now makes getting content and services out there easy and the built in business model offers great opportunity. Now all that is needed is talent who can develop addictive content and services for this platform. Talent who can connect the mobile world with facebook and socialise this content and services. And talent who can find the right way for business to take advantage of this new opportunity; reducing costs, minimising churn, maximising profit and building a rich dialogue with their most valuable customers. That's what we are focused on right now. With all the speculation around product placement triggered by Ben Bradshaws speech to the RTS I thought it worth digging up some of my old posts on the topic. My main thought though is that it won't be ITV or the other broadcasters who gain the most benefit - it will be the programme producers. They make the programmes and are closest to the opportunities for brand integration - they also increasingly recognise the value of their IP. I can't see the smart people at Endemol, RDF or Kudos meekly handing over either the control needed to make this work - or the revenue. Product Placement - part of the solution or part of the problem? As Ofcom hints that product placement may become more acceptable in the UK we're seeing some talk in the US of tighter regulations. Product placement is well established there - with shows like American Idol including over 400 commercial messages! - and a large proportion of advertisers using it as a marketing tactic. "There is nothing inherently wrong with product placement – so long as it is disclosed as required by law. pulling out a magnifying glass—could not possibly qualify"
Remember the old saying - if you're not part of the solution, you're part of the problem? We think consumers have issues with gratuitous use of product placement and it contributes to the general disillusionment with advertising. I ran a very early product placement for Kenco Coffee in the early 90s - as an example of what could be done we had the new packaging featured in Coronation Street - Alf Roberts held the jar clearly as he chatted in the corner shop for around 50 seconds. It was very impressive but we couldn't see any real commercial value. At around the same time we proposed the use to Nintendo in a pitch - we'd pay for placement of the latest console in the episodes of Neighbours that would be shown in the run up to Christmas here in the UK. (Product placement is legal in Australia). We didn't win the pitch, so it never happened. Ten years on we think there is a place for product placement but there are now smarter ways to engage with customers on TV; smart use of iTV will do a lot more for a brand as would exploration of ad funded programming. A conference in the US this week talked about some of the opportunities but makes the point that branded entertainment must resonate with consumers to be effective. Product placement got lots of coverage in the press this weekend.The Sunday Times told their readers what we all knew - that spending with the right middleman can get your product just about anywhere on the BBC (and the rest of UK TV as well). Suitably outraged, the BBC have announced an enquiry! Citing the impact of technology, Pluthoro suggests TV companies should embrace product placement and work with advertisers to create content. As we've noted before product placement isn't new and it isn't that clever. 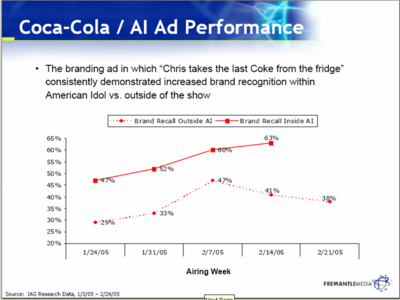 But we have seen some interesting new evidence that shows just how well it can work - take a look at this chart looking at the Coke involvement in American Idol - from a presentation at MIP by Simon Spalding of Fremantle. Coke recognition was significantly higher within the show - where Coke had extensive product placement - than in other shows. Given this sort of evidence - and the threat of PVRs we expect product placement to continue to grow. But with guidance from OFCOM due - and with calls for clearer labeling growing - we expect it to work on a rather more strategic level than the examples the Sunday Times discovered. With the Apple appstore rumoured to be close to 1 million downloads since its launch last July, the other mobile players are getting in on the act - RIM have just launched the Blackberry app store, Nokia launches their version - called Ovi - next month and Microsoft have announced some of the apps they will feature when they launch towards the end of the year. Most of the apps that have done well are either functional (Krafts iFood recipe tool, North Face ski weather guide and LiveStrongs calorie counter) or games (including the addictive Drop7 from the smart people at AreaCode). The games sector is really interesting as we are seeing evidence that the iphone (and the similarly functioning ipod touch) are emerging as a serious gaming platforms. But much as we love branded utility, few apps are what you might call creative - whilst we like the ipint we have yet to see this new tool used for really innovative thinking. It looks like Nokia are excited about the opportunity to create addictive content that builds loyalty to their products. Having made a big push with music they have now partnered with Heroes creator Tim Kring to launch TEVA - something he describes as a Mobile Immersive Experience - through their app store Ovi. The concept seems vague - variously described as a cross between user generated content and a ARG, and a multiplatform interactive storytelling project. "It's a very real-world idea," said Kring. "We are trying to invent a new genre here." "That's why we spent $8 billion on Navteq," said Anssi Vanjaki, executive VP of markets, at a roundtable discussion. "It wasn't just to provide maps or directions. Imagine 1 billion mobile phones contributing their location, and then what types of databases and services can be derived from that." We're long on mobile - and remain convinced it will be a major marketing medium. And with the distribution inherent in the app stores making it relatively easy to get content and applications onto smart phones, we think the key mobile marketing elements will be app related. But as TEVA suggests, this doesn't has to be just about branded utility - the topic of conversation can also be about entertainment. As brands recognise that interruption is much less effective than involvement, we believe smart marketers will look at mobile apps as a fantastic way of building a dialogue with people. And the really clever ones will use that dialogue to make their brand more important to these people – and make the people more important to their brand. Our US team have just launched the latest part of the partnership we have developed between our client Spring and the NBC phenomenon Heroes. As well as the Sprint distribution and the extras, the involvement includes Sprint sponsorship and subtle product placement - but the big win is the brand affiliation; without Sprint this content would not exist. So its essentially brand curated content. This type of spin off was pioneered by influential UK soap Brookside who created Soap Bubbles, where characters from the main soap featured in separate adventures. Mindshare pioneered the brand curated approach with the Rookie - a tie up between our client Unilever Axe and Fox's 24.